Captain Samuel Russel from Pottsville wrote home about the battle of Gettysburg,.. Private Henry Keiser, a member of Company G from Lykens, Dauphin County kept a diary throughout the war and kept a descriptive look at what the 96th did during the Gettysburg Campaign. Letter written by Captain Samuel Russel of Pottsville describing the battle of Gettysburg. During drill at Camp Northumberland, with the camp in the background. Organized at Pottsville September 9 to October 30, 1861. Left State for Washington, D.C., November 18, 1861. Attached to Slocum's Brigade, Franklin's Division. Army Potomac, to March, 1862. 2nd Brigade, 1st Division, 1st Army Corps, Army Potomac, to April, 1862. 2nd Brigade, 1st Division, Dept. of the Rappahannock, to May, 1862. 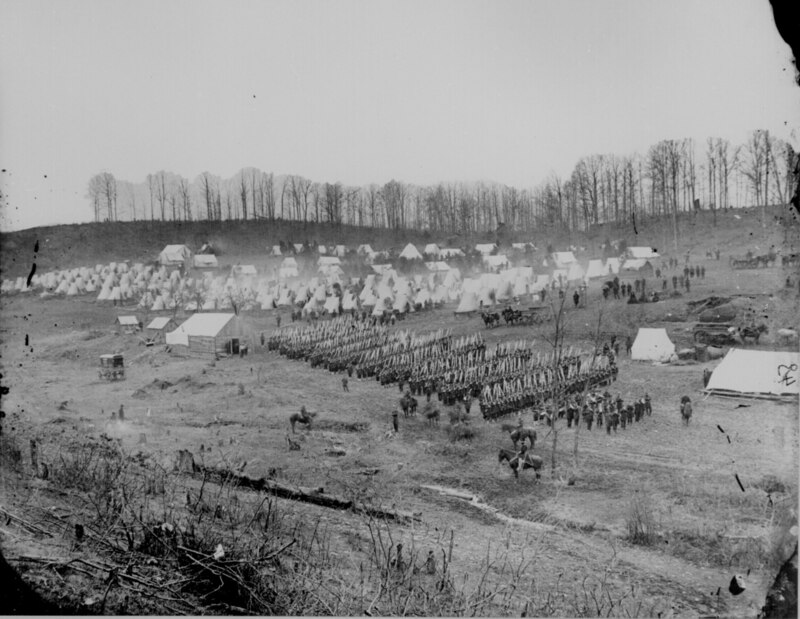 2nd Brigade, 1st Division, 6th Army Corps, Army Potomac, and Army of the Shenandoah, to October, 1864. Duty in the Defences of Washington, D.C., till March. 1862. McDowell's advance on Falmouth April 4-17. Return to Alexandria and embark for the Peninsula. Duty in Maryland till October 30. Operations at Franklin's Crossing April 29-May 2. Gettysburg Campaign June 13-July 24. At and near Funkstown, Md., July 10-13. Duty at Hazel River till May, 1864. Spottsylvania Court House May 8-21. Sheridan's Shenandoah Valley Campaign August to October. Mustered out October 21, 1864, expiration of term.